Budgeting vs. Actual: The budgeted amount of any event can be tracked vs. amount actually spent. The amount actually spent can simply be entered in the "cells" given, or if EBT's accounting system is present - you can update the categories as checks / expenditures are created for the event. Define your own expense types a.> - h.> you can set up descriptions for your own expenses. These are defined by client, and remain in place until you decide to change them again. 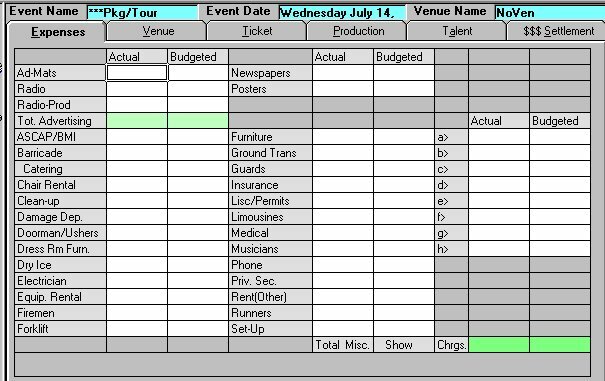 More Expense Categories: The screen displayed above was especially designed for concert and event promoters. However, we have other screens available for meeting planners.